The Ring Floodlight Cam is one of the best outdoor security cameras we've come across. It records great quality video both during the day and at night, offers effective and clear two-way communication, and the addition of floodlights adds an extra layer of protection to your home. Ring is perhaps best known for its video doorbells that not only let you speak to anyone at your front door when you're not around, but can even be used to help catch any unwanted visitors to your home. It makes perfect sense that the company has carried its motion-sensing camera technology across to a security camera that can provide a much wider field of view outside your home. That's exactly what's on review here: the Ring Floodlight Cam, a camera with a floodlight attached that lights up whenever it detects motion. Ring isn't alone in the connected outdoor security camera market though, so can it do enough to offer all the protection your home needs? Unlike some other outdoor security cameras, the Ring Floodlight Cam only works on mains power and doesn't have a wire-free battery option. Therefore you need to make sure you are either a qualified electrician, or can get someone who is around to install it for you. Whichever installation route you choose, for the simplest setup you'll need to make sure there's access to a power socket nearby, and this will determine where you place the camera on your property. It wouldn't be impossible to put a relevant line in, of course, but this starts to get expensive. If you're going to install the camera yourself, you'll want to download the Ring app (available for iOS and Android) to help you with the installation process. Within it, there are a few short installation help videos to assist you with getting the Floodlight Cam mounted and installed on your wall. Note that in the UK mains electrics require official sign-off by a qualified professional to be safe and legitimate. Once the camera is attached, you can use the app to setup and connect it to your home network. Click "set up device" and the app will then ask you to select which Ring product you want to add, then to confirm your location. The app will look for your home network so you can connect it to the internet. It only works on the 2.4GHz band because it gives a wider and longer-distance range - necessary, as your home router will be inside, probably by the telly. You don't have to worry about it constantly using your bandwidth either, as it only uses data when it detects motion or when you're viewing a live stream. Despite comprising a camera and two floodlights, the Ring camera has a relatively compact mounting plate, so you're sure to be able to get it attached to your wall with relative ease. The camera module itself is quite big and is found at the bottom of the mounting plate. It's flanked by the two floodlights which output at 3000 Kelvin, which puts it in the warm lighting category and ideal for outdoor use. Both the camera and the lights can have their positions adjusted so you can make sure you get the best possible field of view. Ring also says the whole unit can withstand temperatures from -20C to 48C, so will be more than capable of withstanding the changing British weather. 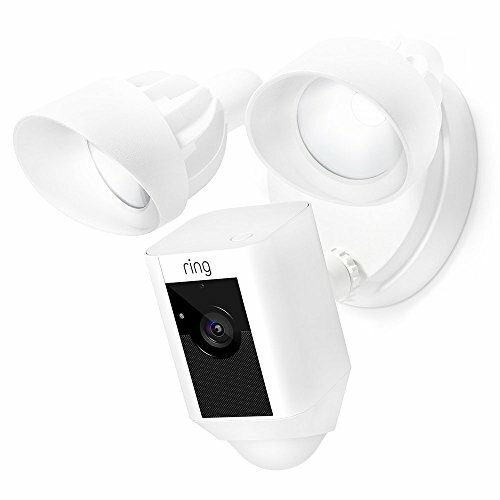 The main reason you're going to get a Ring Floodlight Cam is for its motion detection. It has two-tier detection, which means it can differentiate between objects and people. The passive infrared sensors are more sensitive to objects, such as cars and animals, but you can adjust the settings so it's less sensitive and only notifies you when it detects people. As with the Ring Video Doorbell, you can set motion zones for the Floodlight Cam. This is achieved within the app and allows you to set areas for the camera to look out for any movement. It also allows you to shrink the default zone so it doesn't constantly go off and send you notifications every time a car drives past your house or the regular dog walkers go by in the early mornings. We chose to set our zone just on our driveway, so we were only notified when family members came home or a delivery driver came to the door. You can also set motion schedules from the within the app, which can be used to disable motion alerts during a certain time period and on certain days. If you know you're going to be at home all day on a Wednesday, for example, so you're around the answer the door, then you can set the camera to disable motion for the entire day to save you having to manually turn off alerts. The Ring Floodlight Cam records Full HD 1080p video - both when streaming live and when it detects motion - and saves a clip to the cloud for future reference. The quality is very good indeed: colours are natural and movement is smooth. The field of view is generous too, and one of the widest-angle we've seen on an outdoor camera. However, it only has digital zoom, so when you pinch to zoom on your smartphone screen, the quality does take a considerable knock. Night-time quality does take a dip in quality once again, but the addition of the two bright floodlights helps to illuminate a good portion of the view so you can still see what's going on. Depending on where you have your camera installed will determine just how much of an area you can see at night. For us that meant just a small area of our driveway. In a similar way to the Video Doorbell, the Floodlight Cam allows you to talk to any visitors to your home, either to let them know you're away or tell them where they can go if they're unwanted. Sound quality from the camera is very good indeed - and loud. When we spoke through it to a member of our family, they were convinced the rest of the street would be able to hear us. The built-in microphone is able to pick up sound from visitors from a long distance too. The distance between the camera and our front door is quite far, yet we were able to hear people perfectly when speaking to them through the app. If you're away from home and you do notice pesky intruders, not only will they be illuminated by the floodlights, but you can make the rest of your neighbourhood aware of their presence by activating the built-in siren. It's sure to scare any unwanted guests off and wake the neighbours so they can see what's causing all the commotion. You can show how sorry you are with some flowers, chocolate and a bottle of wine later. Whenever the Floodlight Cam detects motion, it will send a notification to your phone so you can immediately tap into the live view and see what's caused it. The camera will also record a clip of the motion and save it to the cloud for you to access later through your Ring account - either through the app or on a computer. You get 30 days free access to the video recording plan, but after this time is up you'll need to pay a subscription in order to use the cloud-save feature. If you just have the one Ring product, then you can pay £2.50 per month or £25 a year. Alternatively, if you plan on getting several Ring devices then you can pay £8 per month or £80 a year to have all of them covered. Then, of course, there's the Cam's pièce de résistance: the addition of floodlights, which adds an extra layer of protection to your home. Or just some wanted illumination when trying to get the keys in the door. However, it's not a battery-powered product so you do need to consider the installation implication - in that UK that means a proper electrician to install. Still, not having to fuss about a battery or have the concern of anyone breaking into the product is a clear bonus. As security deterrents go the Ring Floodlight Cam brings classic features into the modern tech world and it does a great job of spotting and notifying you of any potential threats - including scaring them away with the built-in alarm. It's a great system. Take away those floodlights and you're most of the way to what the Ring Doorbell is all about. It can be either mains or battery powered - the latter great for renters who don't want to be feeding cables around the place - and offers similar alerts and recordings as the Floodlight Cam. You'll have to buy the actual ring sound - called the Chime - separately, though, which feels like an oddity for what's meant to be a doorbell!